Over the last few years there have been a number of remarkable horned dinosaur discoveries particularly in the United States and Canada. Slowly but surely these new Ceratopsians are being included in model collections and this is Everything Dinosaur’s review of the Collecta Diabloceratops dinosaur model. Known from just two partial skulls, the first of which was found in southern Utah in 2002, Diabloceratops is believed to be a primitive member of the Centrosaurine sub-family of horned dinosaurs, although the skull fossils do share some anatomical characteristics with Chasmosaurines as well. It was formerly named in 2010, Diabloceratops means “devil horned face”, after the Spanish word for devil “Diablo” in reference to the pair of long, horn-like spines that sweep back from the top of this dinosaur’s frill. The design team at Collecta have used vivid colouration to depict the bizarre horns and neck frill of Diabloceratops, the colour combinations of brown and black with flashes of white give this dinosaur model a very striking appearance. The model makers have obviously studied the actual fossil material as they have worked hard to ensure that the broad, deep snout is depicted accurately. If you look carefully, the design team have given their Diabloceratops a prominent bony projection which juts out along the side of the neck. This is called the jugal and it may have been capped by a small horn referred to as an epijugal ossification. Such features are seen in many primitive Ceratopsians, such as the Psittacosaurs which had large uncapped jugals, the tongue of Diabloceratops can also be seen in the mouth of this particular dinosaur model. 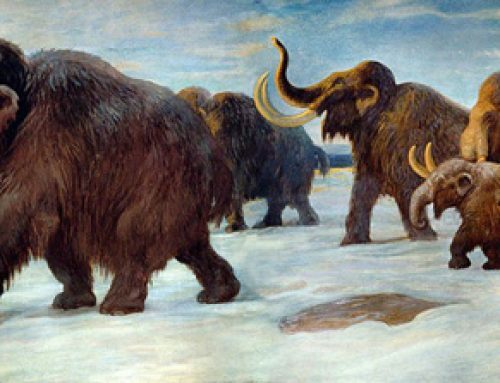 A characteristic of basal Ceratopsians? The model measures approximately sixteen centimetres long and the skin texture along the flanks and on the belly is beautifully marked out. Although this is not technically a scale model, based on an adult Diabloceratops measuring a little over five metres, we estimate that this replica is in approximately 1:32 scale. Over the rump the model makers have added a small crest of bristles. Recent research has suggested that some of these horned dinosaurs had bristles running down their backs, a characteristic also seen in more primitive, basal forms of this dinosaur clade – once again, the Psittacosaurs for example. The tail is relatively stumpy and the short hind legs in combination with the front legs that are not fully straightened give this dinosaur a rather squat, stocky appearance. The posture and body proportions of this dinosaur are not known, as far as we can tell no post cranial fossil material has been found to date. It is likely that the model makers have used reconstructions of the better known Zuniceratops, which has more fossil material ascribed to it, to create their representation of Diabloceratops. Reconstruction based on the likes of Zuniceratops. 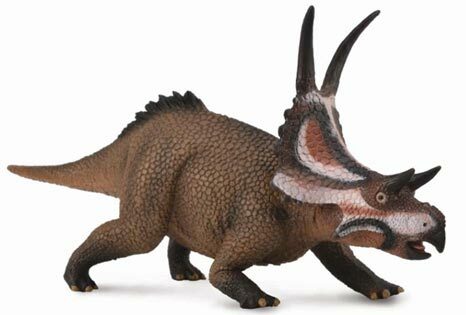 This is a skilfully created model of a lesser known, but spectacular looking horned dinosaur. Congratulations to Collecta for wanting to add models of more obscure Ceratopsians to their rapidly growing prehistoric life model series.